Now Veterinarians can take the most advanced speech recognition solution to the table and create a better patient environment that includes more focused care and efficiency for the practice. Dragon Medical Practice Edition 2 now includes supplemental vocabularies, allowing veterinarians to dictate every element of the patient encounter in their own words with 99 percent accuracy. The creation of more comprehensive notes combined with simplified navigation and transcription is already saving veterinarians a measurable amount of money on administrative costs and significantly reducing the liability associated with inaccurate or incomplete record keeping. In addition, vets can save 30 to 90 minutes every day without compromising the quality of each visit. Customized veterinary vocabulary with over 8000 Breeds, Species, and parasites. 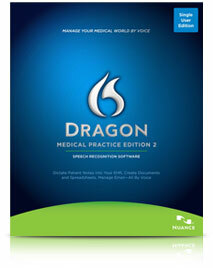 using Dragon Medical Practice Edition 2.